Facebook says it has deleted more than 1.5 million copies of the video of the mosque attacks in New Zealand in the first day after the incident. In a tweet, it said that 1.2 million of those copies were blocked while they were being uploaded. Fifty people died and dozens were injured in Friday’s twin shootings. Facebook said it would also remove edited versions, to stop “graphic content” being shared, although copies still appear to be available online. The social network released the information as politicians and commentators called for more to be done to police live-streaming. 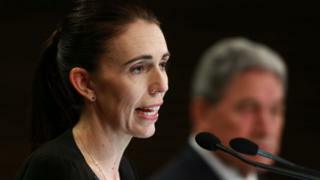 New Zealand Prime Minister Jacinda Ardern said that Facebook and other social media giants had “further questions” to answer about how they responded to the event. Spark NZ, the biggest telecoms firm in New Zealand, told Reuters that it had cut off access to “dozens” of websites redistributing video of the attack. Police in New Zealand said the video was now classified as an “objectionable publication”, making it an offence to distribute or possess the material. An 18-year-old has appeared in court in New Zealand charged with allegedly distributing a live-stream of the attack. He could face up to 14 years in jail if convicted. Social media sites including Twitter and YouTube have also been chasing down and removing copies of the video uploaded by users. Reddit has also banned a discussion forum on its site called “watchpeopledie”, because clips of the Christchurch attack were being shared and because it was “posting content that incites or glorifies violence”. It also issued a plea to users to report anyone uploading footage. The social news site said it had also taken down posts that linked to the video or which showed the attack. Valve, which runs the Steam gaming network, also said it removed more than 100 “tributes” by its members that sought to memorialise the alleged shooter. Some changed their profiles to include the gunman’s name or image and others used gifs of the attack in their bios. The inability of social sites to stop the video circulating was having an effect in other ways in New Zealand. Lotto NZ said it had pulled all advertising from social media sites and the country’s ASB Bank said was “considering” a similar step. Industry groups representing advertisers issued a statement asking their members if they wanted to be “associated” with platforms that did not take responsibility for the content being shared.